Tired of playing the same old poker games? With their new browser-based client, FlopTurnRiver.com (FTR) is offering up an exciting and totally different way to play poker. The game is Open Face Chinese Poker, and it can be played here for free. The game can be played with 2-4 players, and is based on a point system—instead of placing bets on every street, each winning hand is worth a set number of points, the value of which is chosen before the game begins. Some people may play for $1 a point, while higher stakes players may end up playing for $100 a point. Each player is given 13 cards, which are then organized into three rows: the top hand (3 cards), the middle hand (5 cards), and the bottom hand (5 cards). Similar to regular Chinese poker, the bottom hand must be strongest, the middle hand the second strongest, and the top hand the weakest. Points are then awarded based on the amount of hands won, as well as by collecting royalties on premium hands and avoiding fouls. 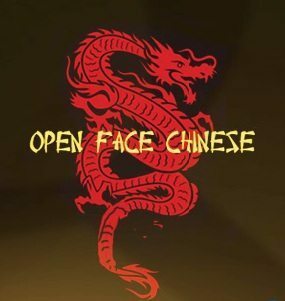 For a more detailed analysis, you can read this article on the Open Face Chinese Poker rules. FTR has created a web browser-based client that is available on both PCs and Macs, and, because it’s run through a browser, it is also mobile friendly, meaning you can play it on your iPhone, iPad, Android, or any other mobile device or smartphone. This also means that the game suffers no slowdown when played on a mobile device, which is a definite improvement over other mobile poker clients. Two different types of Open Face Chinese poker are available to play: regular OFC and POFC (Pineapple Open Face Chinese). The difference between the two is that with POFC, after the first five cards are placed, each player is dealt three cards instead of just one. Players must then choose where to place two of the cards and discard the third. There are also two types of tables available: Open FTR Tables, which are open to anyone, and Private Tables. Players have the option of choosing from either regular or turbo tables, the difference being the amount of time a player is allowed to have per round (5 minutes on beginner tables and only 2 minutes on turbo tables). Open tables are set up like cash games, where a player can leave any time they want. At the moment, play on the Open FTR Tables is limited to heads up play only, but 3-4 handed tables are expected to become available in the upcoming weeks. If you are interested in playing with multiple people, you can create and customize your own Private Table, adding a personalized password and choosing the amount of time allowed and number of rounds to be played. There are two different card modes, click-card mode, and drag-card mode, which are both pretty self-explanatory. On the Open FTR Tables, you can play for free or you can gamble with FTR Points. Only FTR members can play and earn points, but registering a free account is easy and will instantly earn you 1000 points. Click here for a detailed description on how to earn FTR Points. Similar to other poker programs, players will be able to trade in their FTR Points and purchase FTR clothing and items. In the future, FTRP will also be used as buy-ins for freerolls and real-money tournaments. On the beginner’s tables, players can also compete against computer opponents (bots). The bots, consisting of Glass Joe and Bald Bill, are relatively easy to beat once you have a decent grasp of the game, and they earn you FTR Points. They are also a wonderful way to learn the ins and outs of OFC, and a great way to win over new players who may feel slightly intimidated by the game’s rules and scoring system. Speaking of the scoring system, at the end of every hand two buttons appear at the bottom of the screen: “Did I set it right?” and “Did I play it right?” This allows a player to share their hand history on the FTR forums with the rest of the FTR community. It’s yet another great way for players to learn the intricacies of the game. At the moment, no major online poker company supports OFC, so this is the best opportunity to learn how to play and compete against real players. Because of the novelty of the game, there aren’t a lot of players currently on the tables, and it can often take several minutes to get a heads-up game going. That being said, the client itself is clean and user-friendly, and I didn’t notice any slowdown or glitches. Hopefully, as the number of players increase, tournaments, high stakes tables, and real-money games will be made available. 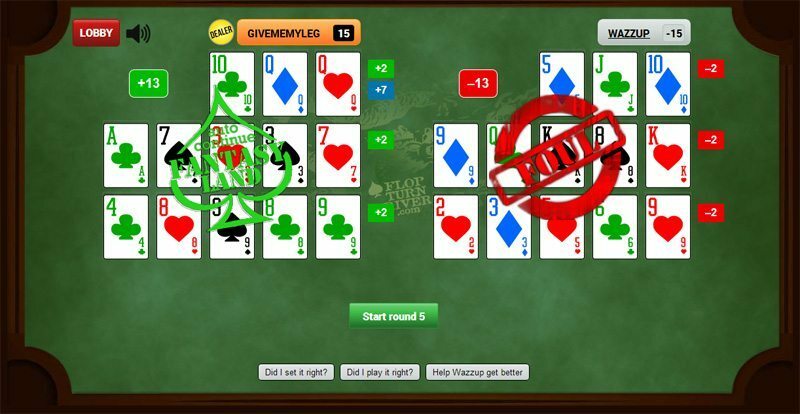 All in all, Open Face Chinese poker is an exciting game, and FTR’s browser-based client is a blast to play.